This is another of Hahnemann's constitutional remedies which, as Farrington says, "may come into use, in almost any form of disease." We may say come into use because it may be on account of certain idiosyncrasies. which come under the remedial power of Calcarea that the disease, whatever it is, is made less amenable to ordinary treatment. The temperament of Calcarea is altogether different from that of Sulphur. You remember the lean stoop-shouldered Sulphur subject. Calcarea is on the contrary what cannot be better expressed than in the term used by Henry N. Guernsey viz. ; Leocophlegmatic temperament. The Calcarea patient is constitutionally fat, over-fat or strongly inclined to obesity. The color of the skin is white, watery or chalky pale. Of torpid disposition (especially children), sluggish or slow in its movements. The Sulphur is almost the exact opposite, quick, wiry, nervous, active. There is none of the bilious, swarthy, yellowish appearance in Calcarea that we find in Lycopodium. These three remedies Calcarea, Sulphur, Lycopodium are a trio that find each their counterpart in many persons the world over. Of course we find the tendency to obesity under other remedies, as for instance, under Graphites, but with this obesity we almost always find accompanying it the peculiar skin troubles of Graphites. Sometimes we seem to find a condition that seems to simulate each remedy in some one feature; for instance, the obesic temperament of Calcarea and the eruptive tendency of Sulphur. This may combine so as to make a case that will be covered by Hepar sulph. Such cases are more difficult to cover with a perfect simillimum. But when we do find a purely Calcarea, Sulphur or Lycopodium subject the fact is inestimable as a help to a brilliant result in many cases. This remedy with Sulphur and Calcarea forms the leading trio of Hahnemann's anti-psoric remedies. They all act very deeply. Each finds its affinity in a certain class of people or temperament. Lycopodium acts favourably in all ages, but particularly upon old people and children. It acts upon persons of keen intellect, but feeble muscular development; lean people, leaning towards lung and liver troubles. Such people are apt to suffer from lithic acid diathesis for which this is also great remedy. The Lycopodium subject is sallow, sunken, with premature lines in the face; looks older than he is. Children are weak with well-developed heads, but puny, sickly bodies. They are irritable, and when sick awake out of sleep ugly and kick and scream and push away the nurse or parents. These temperament remedies are not always appreciated by those who do not understand the true spirit of our own art of healing; but when appreciated the skillful observer can often see the picture of the right remedy in the face and build of his patient before he speaks a word. A remedy must not only be well proven, but extended clinical use and observation is necessary to develop it and indicate its true sphere of usefulness. One of the trio in pain killers. Aconite is also a great pain remedy. If we were to name the three leading remedies in this respect it would be Aconite, Chamomilla and Coffea. The Aconite pains are always attended by the extreme restlessness, anxiety and fearfulness of this remedy. The patient tosses about in agony, "cannot bear the pain, nor bear to be touched, nor to be uncovered." Well, you say, all remedies have pain. Not all, and not many so intense pain. Opium and Stramonium have painlessness oftener than pain. The Aconite pains are intolerable and generally worse in the evening or at night. Then we have often alternating with or sometimes even in conjunction with the pains numbness, tingling, or formication. It is also one of the leading remedies for pain, and there is this peculiarity about it, the pain is not always in proportion to the gravity of the case, and we often see, for instance, in labor, a great deal harder pains of which the patient does not complain half so loudly. But in the Chamomilla case the patient is exceedingly sensitive to the pain and exclaims continually, "Oh; I cannot bear the pain." Many times have I met this condition in labor cases, and in the majority of them the cross, peevish, snappish, condition of mind accompanying, and seen it changed in a short time to a mild, uncomplaining, patient state, by a single dose of Chamomilla 200th. This sensitiveness to pain is not confined to labor cases, but I have often observed it in neuralgias, toothache, rheumatism, etc., and the same happy results follows its use. This condition of sensitiveness is often found in coffee drinkers, or in those who have been addicted to narcotics. Chamomilla is very useful here. There is another sensation which is often found in conjunction with, or sometimes alternating with, this pain or sensitiveness, and that numbness. Coffea also vies with Chamomilla and Aconite as a pain remedy. "Pains. insupportable, drive to despair." "Exasperation, tears, tossing about in great anguish." Here again we would not give Coffea in an habitual coffee drinker, but Chamomilla rather. The particular localities where these pains mostly occur are in the head, where the pain is generally one-sided, feeling "as though a nail were driven into the head." The great characteristic around which the whole action of Camphor seems to revolve is: "Great coldness of the external surface, with sudden and complete prostration of the vital forces." It is no wonder Hahnemann headed his trio (Camphor, Cuprum and Hellebore) of cholera remedies with Camphor. If we were to sum up the same condition in one word it would be collapse. No remedy comes nearer to Camphor than the last of the trio, viz., Veratrum album, but Camphor has the collapse with painless stool or even no stool at all, while Veratrum has the collapse seemingly as a consequence of the very profuse evacuations of stomach and bowels. Both have great external coldness, but Veratrum has a very marked appearance of cold sweat upon the hippocratic face, especially forehead. Cuprum leads the trio, when the cramp in stomach and extremities is the most prominent symptom. These remedies are indicated when these characteristic symptoms appear, not only in cholera, but in any disease. There is one peculiarity in the coldness of Camphor, viz., the patient will not be covered, or objects to it, no matter how objectively cold he is. The signal success of Dr. Rubini, of Naples, in treating five hundred and ninety-two cases of cholera with Camphor verified the prediction of Hahnemann beyond question. In cholera, cholera morbus, or cholera infantum the cramping pains are sometimes terrible. Dunham said: "In Camphor collapse is most prominent; in Veratrum album, the evacuation and vomiting; in Cuprum, the cramps." In whooping cough "children get stiff, breathing ceases, spasmodic twitchings; after a while consciousness returns, they vomit and recover but slowly;"
Here is a remedy that has a characteristic "Cold sweat on the forehead". It makes no difference whether it is cholera, cholera infantum, pneumonia, asthma, typhoid fever or constipation; if this symptom is prominently present, and the patient is in anything like a faint, collapse, or greatly prostrated condition, Veratrum album is the first remedy to think of. 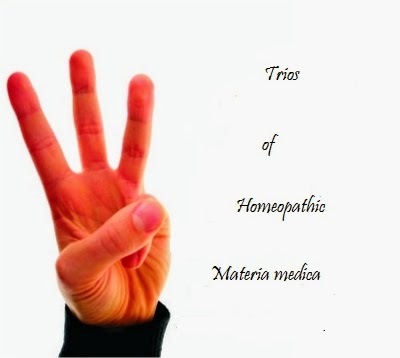 It is one of Hahnemann's trio of remedies for Asiatic cholera, Camphor and Cuprum metallicum being the other two; and today his indications for its use stand as true as when he first gave them to the profession. It abides the test because it is founded upon a natural law of cure, which is the same "yesterday, today, and forever."